Let's say you want to start checking out 55+ communities and you know you want to live on the East Coast but you're not sure where. What's the best way to know for sure? By visiting all of the major active adult community hot spots. And the best way to do that is to hop in the car and take a road trip. 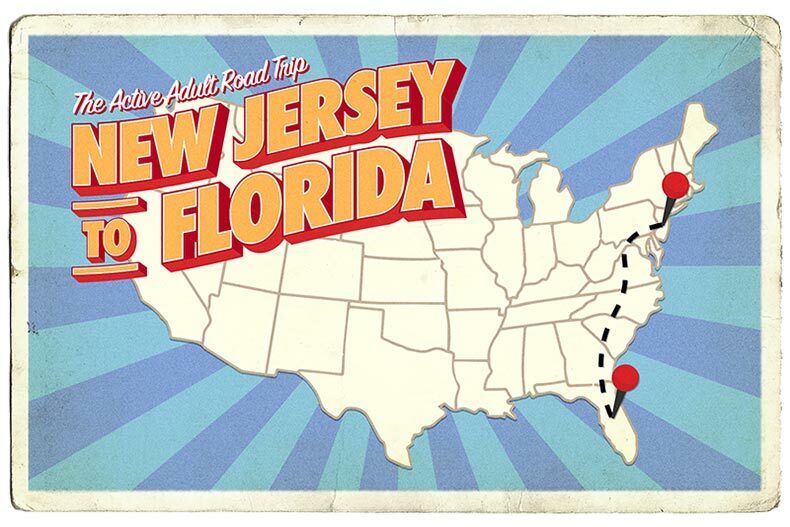 Driving from New Jersey to Florida can seem like a momentous undertaking, but it doesn’t have to be that way. Active adults who choose to do it the right way can make the drive a vacation in itself. Regardless if your starting point, you're going to make your way to the New Jersey Turnpike eventually. What becomes Interstate 95 will guide you the entire way down the Eastern seaboard. But in the meantime, it's going to take you right through Philadelphia where you can stock up on cheesesteaks and other essentials before the long ride ahead. If you want an early stop to stretch your legs, you could do worse than spending some time in Philly. Start with the Philadelphia Trolley Works city tour. Riders get a broad overview of the city during a 90-minute, narrated ride that highlights the best of the city’s offerings. It is a hop-on, hop-off tour, so it is easy to stop and go as you please. Then check out the National Constitution Center, Independence National Historical Park (where the First Continental Congress met in 1774), and the Liberty Bell. The next big city you'll pass through is Baltimore. If you're interested in seeing what Delaware has to offer you might want to make a detour to see some of the great 55+ communities they have to offer. However, if you're more interested in warmer climates, head south. You'll run into Washington, D.C. where you can stop to take in many of the sights of the nation's capital. There's a lot there to do for active adults. The most obvious place to start is the National Mall, home to Smithsonian museums like the National Air and Space Museum, the National Museum of American History, the National Museum of African American History and Culture, and several others. There's also the Korean War Veterans Memorial, the Vietnam Veterans Memorial, the Franklin Delano Roosevelt Memorial, and the Lincoln Memorial to see. From there you pass through Virginia, circumventing Richmond until you get to North Carolina. And if you've been driving straight through, you've reached your first real destination in terms of active adult community hot spots. North Carolina and South Carolina have become must-visit spots for the 55+ crowd thanks to the rise of the halfback trend. But before you even travel all the way to Florida, stop to take a look around at all these states have to offer. Plan to arrive in Durham early to enjoy a hearty breakfast at Guglhopf Bakery, Cafe, and Biergarten. Where else can travelers find sweet and flaky cinnamon schnecken for breakfast and craft beers and cocktails at night? Stop in and grab some warm pastries for takeout, or spend a little time enjoying your treats in the cozy cafe. The Sarah P. Duke Gardens at Duke University offers free admission. It is open year-round from 8 a.m. until dusk. The grounds feature miles of beautifully flowered paths and a Historic Terrace area that features a koi pond. The university grounds are also worth exploring, especially Duke Chapel. Later in the day, you can visit downtown for additional sightseeing and shopping. There is a diverse selection of outstanding restaurants, and Vin Rouge Restaurant is highly rated. The French bistro serves delicacies like duck confit, steak frites, and fresh oysters. Durham has hotels and motels priced for all budgets. Hotels like Red Roof Inn or Quality Inn offer rooms for as low as $60. Four-star properties like the JB Duke Hotel advertises rooms for under $200 a night. Bonus, JB Duke Hotel is on the grounds of Duke University. Charlotte is about 144 miles west of Durham. Start your day here with a visit to Ballantyne Hotel Resort and Spa. This luxurious public day spa offers world-class pampering with upscale spa treatments, a sauna, indoor and outdoor pools, and relaxation areas. You can also stay here overnight at their hotel. Spend the afternoon taking in some local culture at Charlotte’s world-famous museums, like the Harvey B. Gantt Center for African American Arts and Culture and the NASCAR Hall of Fame. As evening approaches, head over to The Fig Tree, one of this city’s most renowned restaurants. Open since 2005, this fine dining establishments features upscale entrées like sautéed scallops, or for the more adventurous palate, a grilled New Zealand Elk Chop. Myrtle Beach is about 175 miles southeast of Charlotte, and temperatures average around 60 degrees during December. Don’t miss Brookgreen Gardens, a stunning wildlife preserve and sculpture garden that offers year-round events, including a holiday exhibit. Other must-sees include Ripley’s Aquarium and the Myrtle Beach Boardwalk. For a casual dinner, try Simply Southern Smokehouse. This local favorite serves up heaping portions of barbecue chicken, pork chops, pickled okra, collards, and other southern delights on a nightly buffet. For room and board, the shoreline is dotted with lodging options, including Marina Inn at Grande Dunes and Island Vista. Many of these hotels offer discounted rates during the off-season. There's always something to do in historic Charleston. This charming, genteel city is worth a stop for at least a day or more to tour its legendary, historically significant homes. Many grand homes can be seen at the South of Broad section and along Rainbow Row. Next, head over to The Battery, an area with a seawall, adjacent path, and former American Civil War artillery that has been converted into an expansive, scenic park. Named as the No. 2 restaurant in the city by Eater Charleston and a “soul food institution” by Bon Appetit, Bertha’s Kitchen is a family-owned eatery lauded for its outstanding fried chicken, collard greens, and cornbread. Be sure to stop in for lunch or dinner. When it is time to settle in for the night, check in to one of the area’s best hotels, like the boutique Zero George Street or a more moderate Town & Country Inn and Suites. After leaving the Carolinas, you'll hug the coast as you cross through Georgia. That'll run you right past Savannah, a wonderfully quaint town worth stopping in. 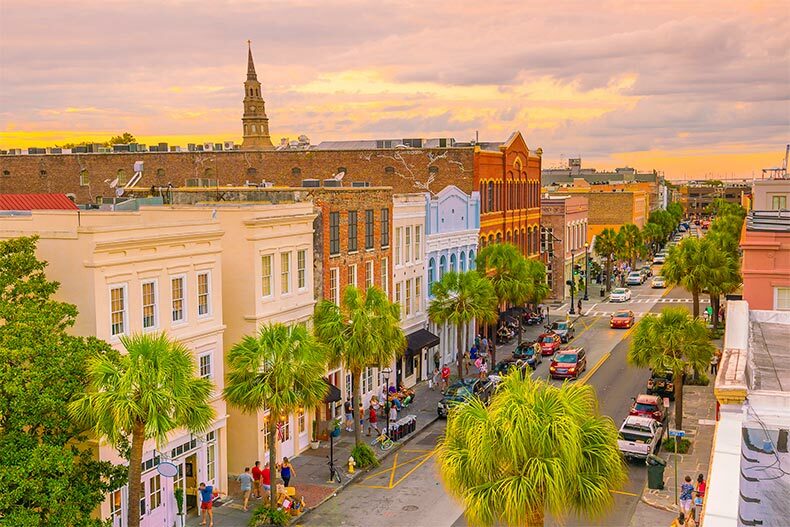 Famed for its architecture, oak trees, and southern hospitality, Savannah is a year-round destination for tourists and history buffs. Head downtown where you'll find the Jepson Center for the Arts, SCAD Museum of Art, and Georgia State Railroad Museum. Also located downtown is Forsyth Park, a 30-acre park with basketball and tennis courts, as well as walking and biking paths and a large, historic fountain. St. Joseph’s Hospital is only an eleven-minute drive away from the community. Finally, you've made it to Florida and at this point, there is so much ground to cover you'll probably want to have a good idea of where you'd like to visit. You could head all the way down to Miami and Palm Beach County to see what all the fuss is about. Or you could stop beforehand in Jacksonville, a rising region when it comes to active adult communities. There's always Daytona Beach, where you can visit Latitude Margaritaville and see if it lives up to the hype. Or you can head to Tampa, which we named the best place to retire in 2018. There's also Ocala and all of the great communities to be found there.